I'm Kati, and I blog over at from the blue chair. I admit I was quite excited when Lynne asked me to take on a recent Aurifil challenge. When I signed up to be considered, I said I would make a quilt using this beautiful box of thread, but it took me weeks to finally come up with the right design. 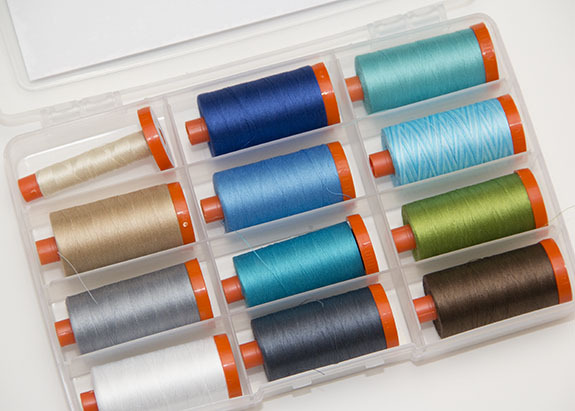 Sheena Norquay is the creator of this thread collection. These colors are absolutely perfect for me--very much my colors. I wanted my design to be true to the original name of the collection: Seascape. I started forming a very impressionistic view of a seascape in my head. Originally, I intended to arrange the colors such that there would be water, land, grass and sky. It didn't feel right. I started mixing my fabrics and came up with this creation. This quilt was ultimately inspired by those layered sand creations almost every kid has made as some point. All the strips for this quilt were cut very carefully, but are free-hand. It may look a bit overwhelming for those who haven't sewn curves, but it comes together quite easily. It's a great way to begin working with curves because this method is so forgiving. For this quilt I used 18 different fabrics. Fabrics should be WOF. Do not trim selvages until after quilting when squaring the quilt. I used 1/2 yard cuts, but 1/4 yard cuts would be plenty. This quilt is approximately 42" x 55". Layer two fabrics. The bottom one should extend past the top by a couple inches. Both fabrics should face right side up. Line up selvages. 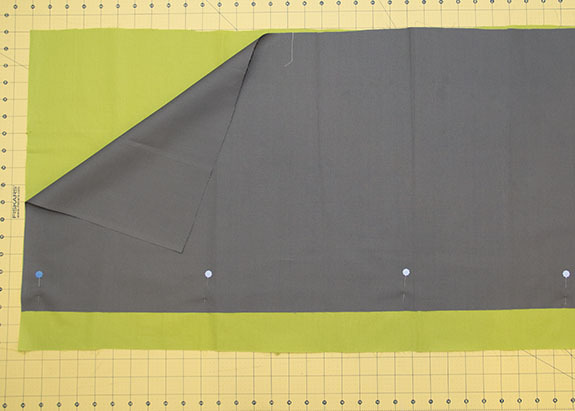 Pin together to prevent fabrics from shifting while cutting. Begin cutting a free-form curve. Cut a gentle curve. Sharp angles are difficult to sew. Remove pins as you cut. Make the strip as thick or thin as desired (keeping seam allowance in mind). After cutting about 12", mark corresponding points on fabrics to match when sewing seam. Mark fabric every 5" - 6". Carefully shift fabric if using a smaller mat. Continue cutting and marking fabric until full WOF has been trimmed away. Set aside excess fabric from bottom piece. Fold top fabric onto lower section of bottom fabric, right sides together. 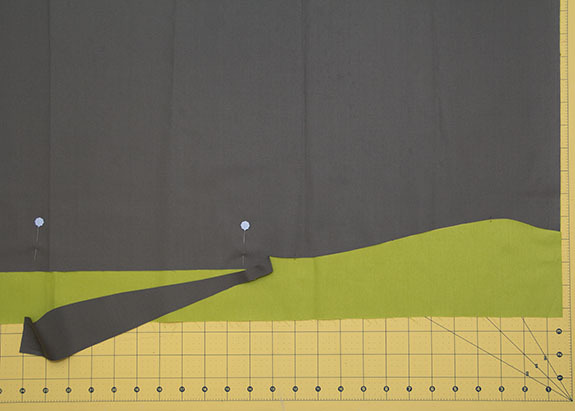 If desired, pin seam at each matching mark. Carefully stitch seam, easing fabric together directly in front of needle. Do not stretch fabric. Stitch slowly. 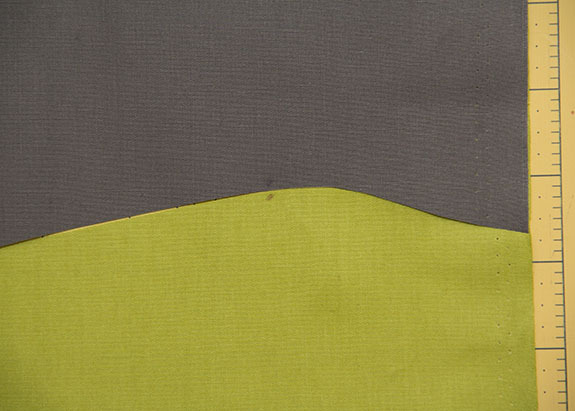 Press seam down (use starch if necessary) and repeat process with next color. Place completed section face up with the next fabric layer on top, also face up. Again make sure selvages are lined up. 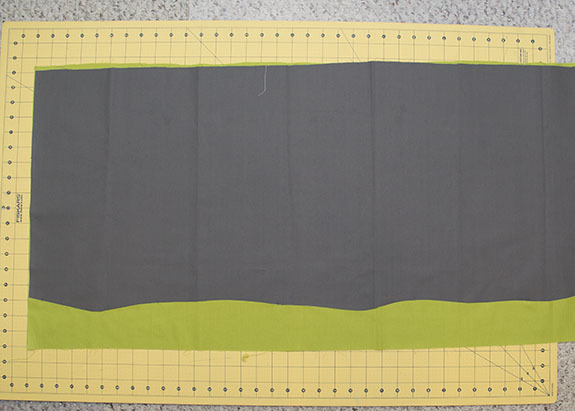 This will help the sections remain more square when sewing them together. To make this quilt, I sewed my fabrics together in sections of 5 or 6, then sewed these sections together. This made the sewing process less cumbersome. I quilted this project on my machine using most of the threads in the box. These threads are beautiful quilted. 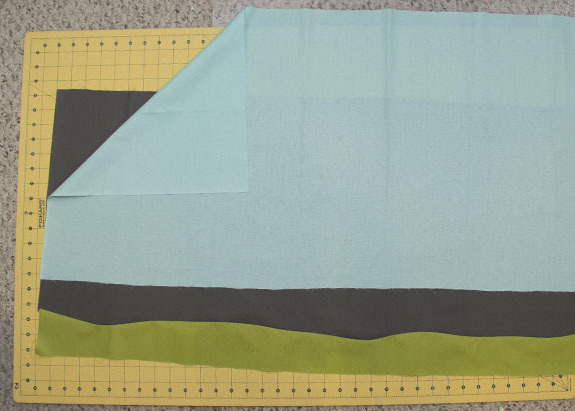 In the past I have had problems free-motion quilting with Aurifil 50wt, but found that using a top stitch needle eliminated all issues I've had previously. I quilted each seascape layer according to color: water, air, sand, rocks, leaves, and sun. 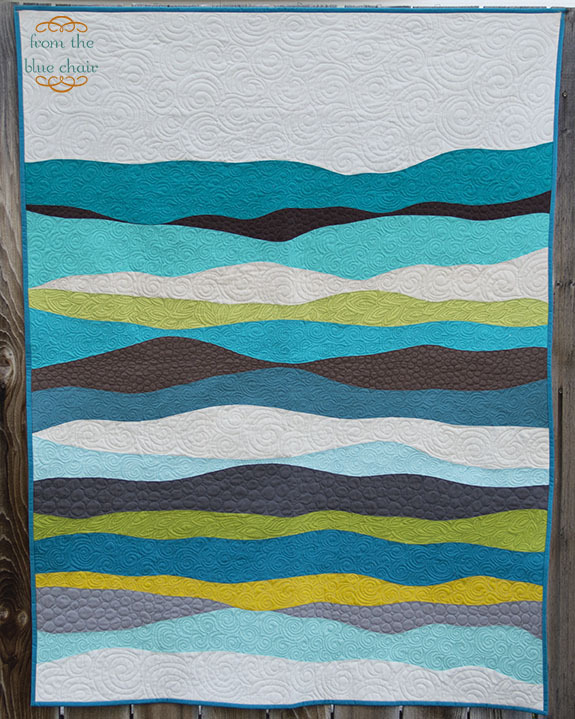 Feel free to check out more pictures of this quilt over on my blog, from the blue chair. Thanks so much to Lynne for giving me the chance to take this challenge! It's gorgeous! The quilting is fabulous! Love the quilting, fantastic job! LOVE your quilt, Kati! And very nice tutorial, you explained the process perfectly. That is fabulous Kati! You are so talented! Gorgeous Quilt Kati, love your quilting! Absolutely gorgeous! 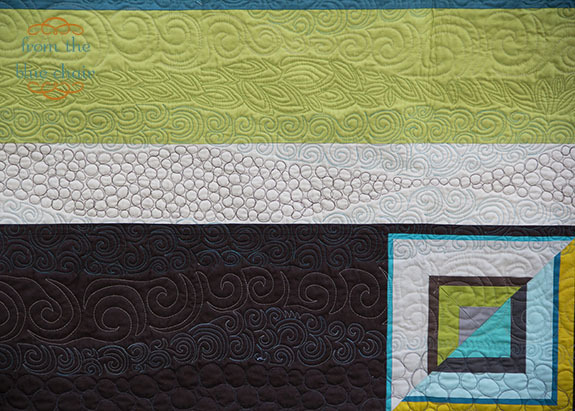 Love this quilt...the curvy piecing and the fabulous quilting. Well done! I love you quilt but am still scare of curves. Guess I need a hands on class! Aurifil thread is wonderful! beautiful quilt, fantastic! 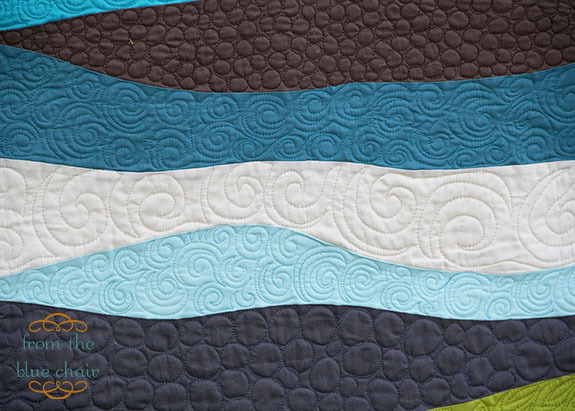 love the curves and quilting. Beautiful! Thanks for sharing your technique, which I will try someday. Your quilt was a perfect use of the threads. Oh My! It's absolutely gorgeous quilt! just gorgeous! I might not be too scared to tackle something similar! Absolutely stunning. You should be so proud. This is a beautiful piece of fabric art/ quilt art. Absolutely beautiful! I want that box of thread now! !